Kaboo Casino is an exciting edition to the world of online gambling. Offering players a versatile, secure, and thrilling iGaming experience, Kaboo challenges its players with missions, giving them the chance to earn Echoes, which can be exchanged for free spins. This is an ideal online casino for anyone looking for an iGaming experience that is extraordinary. Are you searching for an online casino that will provide you with an iGaming experience that is anything but ordinary? If so, Kaboo Casino may be able to offer you the adventure you’ve been waiting for. As you will discover in this Kaboo Casino review, this internet gambling destination is anything but average. 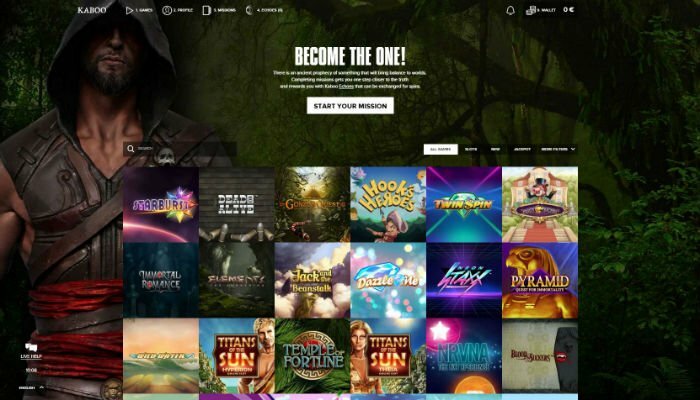 Operated by Betit Group (an iGaming company known for Sportsbook and Casino SuperLenny and Thrills Casino), Kaboo seeks to provide players with an amazing gaming experience and loyalty features. Kaboo Casino software is powered by NetEnt. However, the casino also features software form top gaming developers including NetEnt, Microgaming, Play n’ GO, BetSoft, Evolution, and NYX. Therefore, players can expect a well-rounded and highly diverse gaming experience that includes an incredible selection of video slots, as well as table and card games. 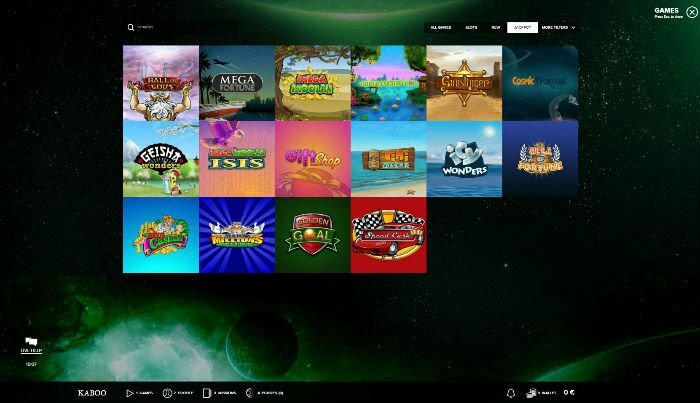 Some of the exciting Kaboo Casino games you’ll find in this brand’s database includes slots like: Starburst, South Park: Reel Chaos, Dracula, Wild Rockets, Gonzo’s Quest, Aliens, Mega Moolah, Jurassic Park, Avalon II, and many, many more. An exciting range of video, bonus, 3D, and Progressive jackpot slots are available. In addition to its desktop and Flash gaming platform, players can enjoy great casino games on the go via the Kaboo Casino mobile platform. What’s more, there is also a Live Casino option for players seeking an authentic gambling experience that lets them interact with real human dealers. Kaboo players can do more than play their favorite casino games. 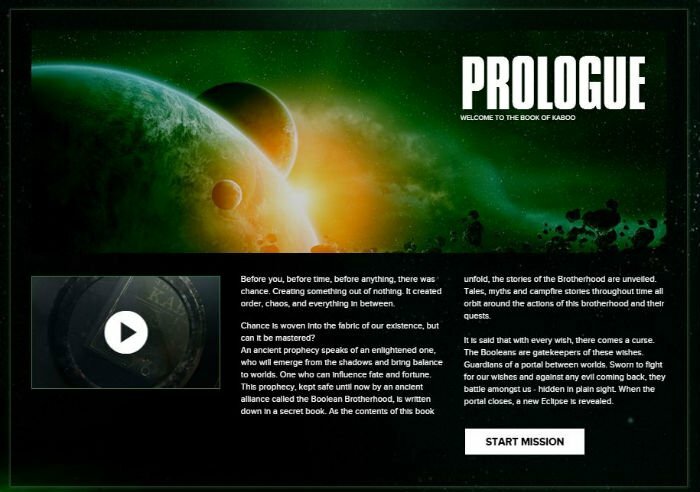 In addition, players can progress through stories written in “The Book of Kaboo” and follow the story of the Boolean Brotherhood, which guards the parallel universe of Kaboo. 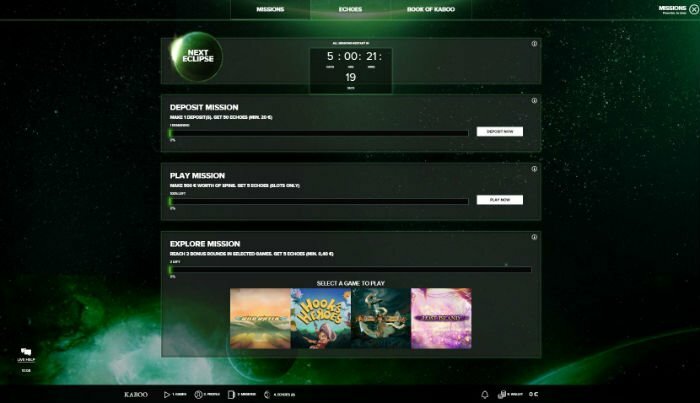 Players can accept missions and complete them using select casino games. Kaboo Casino bonuses include both a welcome bonus for new players, as well as loyalty rewards for existing players. New players who register with Kaboo Casino can take advantage of a 100% bonus offer on their first two deposits, which rewards a total of up to €200 bonus, plus 100 free spins (Echoes) on NetEnt’s slot Starburst. Kaboo Casino tries and succeeds in flavoring it's game play with mission objectives. In order to take advantage of other Kaboo Casino promotions, players complete missions to earn Echoes, which they can exchange for free spins on the Echoes page. Players can choose from many popular casino games with different spin values. Kaboo Casino payment methods include credit cards, digital wallets, bank transfers, and prepaid cards. While it doesn’t have as diverse a payment selection as other online casinos, it does offer secure, well-known and trusted banking solutions including: Visa, MasterCard, Skrill, Neteller, Euteller, and Trustly. The online casino accepts payments made in multiple currencies including: GBP, USD, EUR, NOK, and SEK. Kaboo Casino supports multiple languages including English, Swedish, Norwegian, and Finnish. Its customer service includes live chat, email, and telephone. However, at the time this review was written, support was not available 24/7. While support is offered seven days a week, operating hours were available only from 10:00 to 00:00 CET.